Image of Barbara von Enger arriving at the Elie Saab show by Adam of Le 21eme. We love the colour story here. See how the colours mingle together like friends at a dinner party. Must ask Barbara the history of her coat. It's divine! We wish you all a very radiant week. Be ye kind one to another. 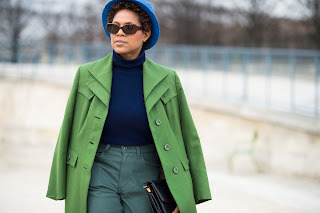 Love the green coat along with the blue hat - ideal for pre-spring! Well done Barbara! The green is both classic and fresh! I love that green coat! It's a great color! Gorgeous coat. I love the different shades of green. I know you stunned everyone, Barbara! Blue and green combo, so inspiring.